After clicking OK on the error message, DeskManager may become unresponsive and eventually shutdown. This issue is caused by security settings in Vista. If you have not yet done so, download and install the QuickBooks Interface program: qbfc4_0installer.exe. Save this file to your desktop and double-click on it to install it. Right-click on the DeskManager shortcut on your desktop and select Properties. 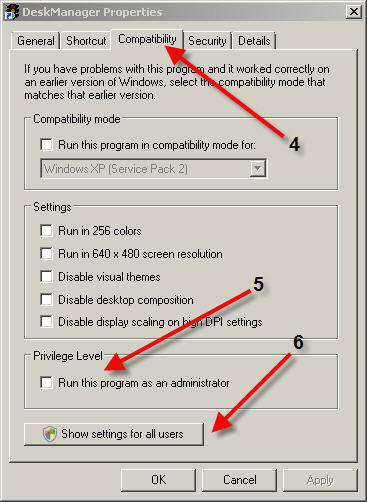 Locate the Privilege Level section at the bottom of the dialog and make sure that Run this program as an administrator is unchecked. Click on the button below this section labelled Show settings for all users. Make sure that Run this program as an administrator is unchecked on this dialog as well. Click Apply and then OK to close both dialogs.